The FMC welcomes membership application from climbers and walkers of all abilities who should be over the age of 16 and living within the Fylde Coast area. 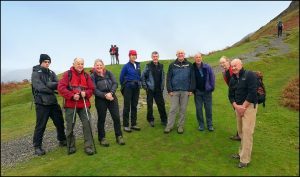 Specific meets are arranged for introductory members, but so that they’ll better get to know other members as well, beginners are urged to attend as many of the club’s many functions as they can. The current rule book can be downloaded here. FMC members can benefit from special discounts with many outdoor equipment shops and online suppliers, see here for latest advice. The Club is affiliated to the British Mountaineering Council (BMC) and members can use its many services. BMC affiliation also ensures that club members benefit from their civil liability cover. If you would like to register as an FMC intro member, please fill-out the information below and it will be forwarded to the FMC Membership Secretary. Please provide brief details of your walking / scrambling / climbing experience. We have members of all abilities and levels of experience. The club offers support, experience and progression for new members, but we do not offer professional mountaineering instruction. Your details will assist with the selection of appropriate mentors and venues for introductory meets. Please provide any relevant thoughts on how your think being member of the Fylde Mountaineering club will assist you in your mountaineering goals. To provide feedback on our marketing, please detail how you found out about the Fylde Mountaineering Club? - We use your address to post out membership cards & the club magazine. - We use your email address to send a 'What's On' agenda for upcoming club events. Your data will also be passed to the BMC to register you as a member of the insurance scheme. We do not routinely share your data with any third parties (e.g for advertising purposes). Listed Full and Introductory Members are covered by the BMC’s civil liability scheme and can also use its other services. I am over 16 years of age. I wish to apply for introductory membership of the Fylde Mountaineering Club. I accept that mountaineering, rock climbing & fell walking are potentially dangerous activities and I wish to participate in them voluntarily. I agree to waiver any claim for injury that may befall me due to lack of reasonable care by the club or any of its members. By clicking on submit below, the details above will be forwarded to the club membership secretary. You will be forwarded to our online payment gateway and can make a payment for your intro membership.